My Altitude Sickness in Puno caused us to be temporarily separated from our Intrepid Travel Group. 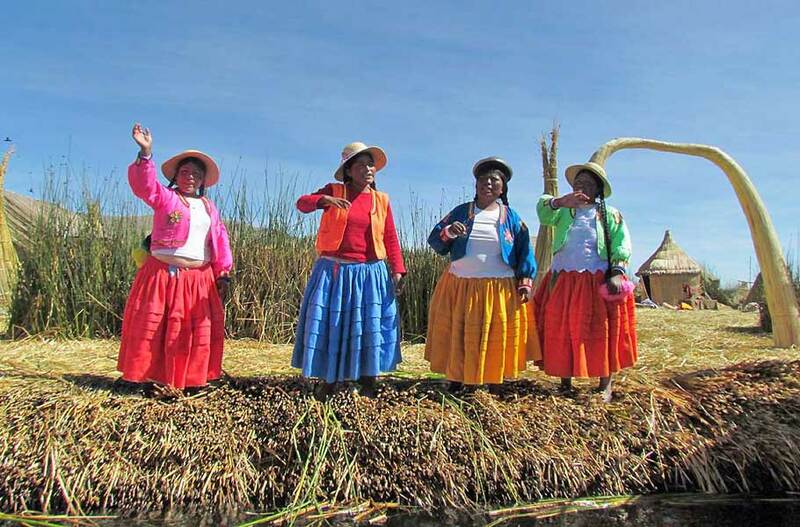 So, we used a local service for an Uros Islands Tour. 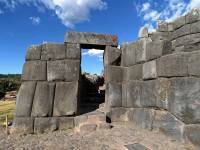 The tour is the premier attraction when visiting the Puno area. 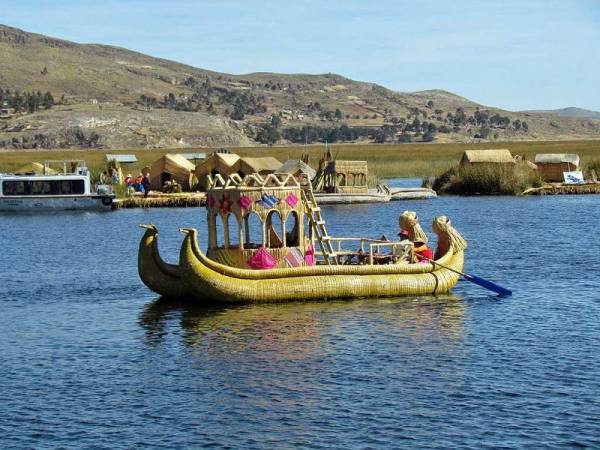 The islands are a short distance from Puno by boat at low speed through the reed growth. These islands are man-made. 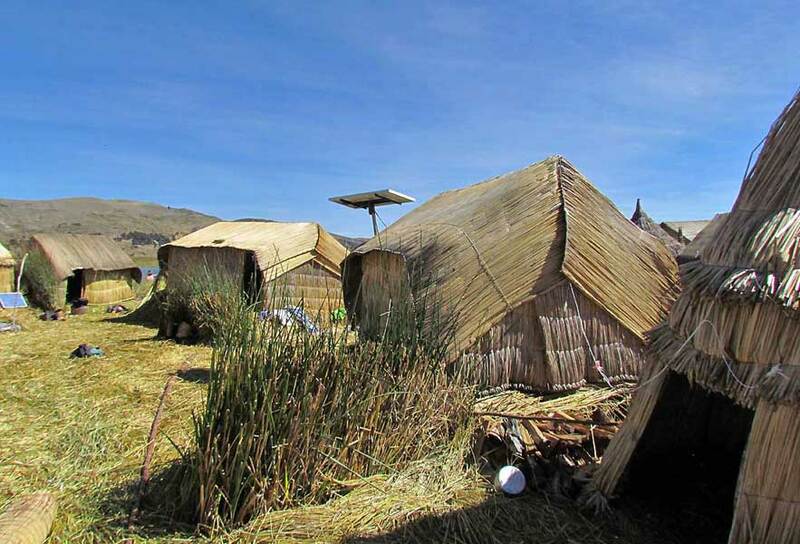 They are constructed from reeds by native Ayamara speaking pre-Inca indigenous peoples. Tours run daily from a number of Puno hotels or from the harbor. The tour takes less than four hours. The Uros control all visitor traffic to the area. They have worked out a schedule that allows all islanders to participate in the benefits of tourism. Tour boats are assigned to visit one specific family. In the past, the Uros survived on fish and reeds, but today tourism has a major impact on their life style. 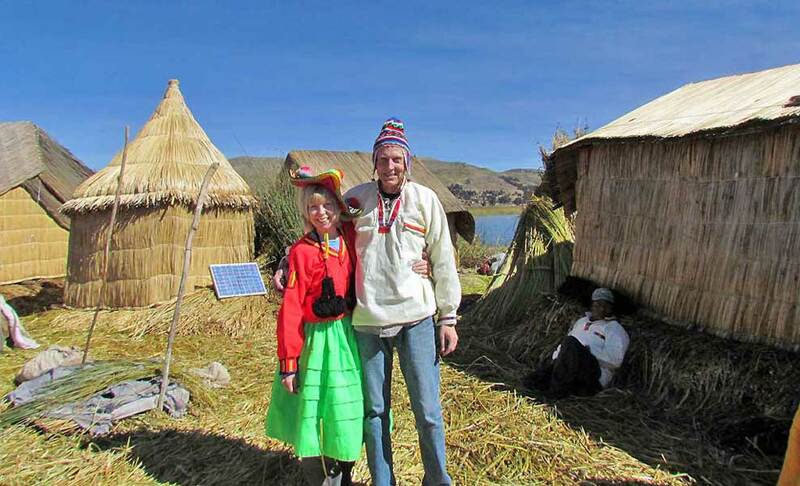 Our Uros host family greeted us as we arrived at their reed platform. The elected leader of the extended family acted as our tour guide. He provided information and led demonstrations on their life style. 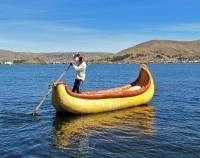 He explained that the Islands are anchored in up to 50 feet of water in the reed bed areas of Lake Titicaca. The family then demonstrated how they build a lattice work of totora reeds to create a flat living surface. 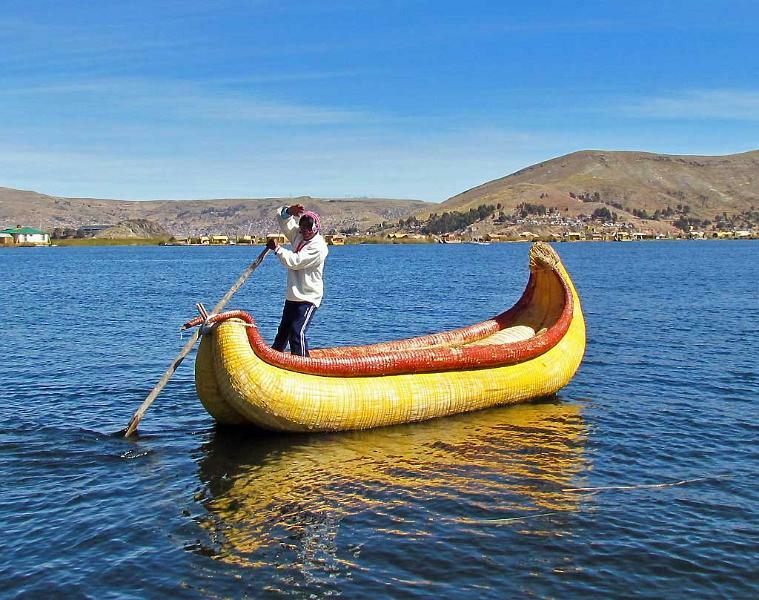 The Uros walk barefoot on the surface. 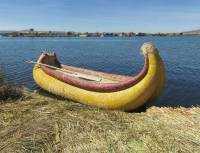 The reeds are also used to build their shelters and their boats. Plus they explained that the reeds are edible too. Then they showed us how they prepare the small fish they catch in the lake. 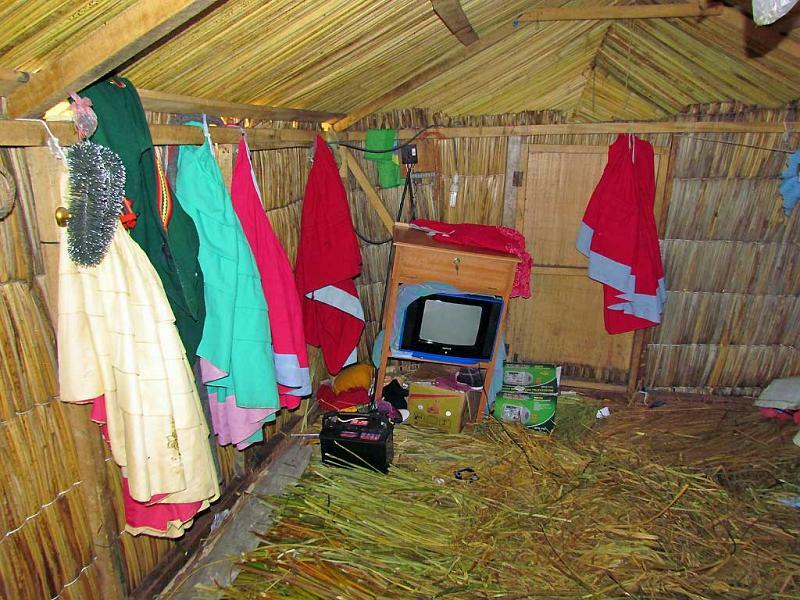 Next they invited us inside their shelters. They gave us traditional clothing to put on and encouraged us to take pictures. They also answered questions. We asked how they keep their children safe from the deep, cold waters of the lake. They explained that they teach their children to swim before they learn to walk. They use plastic bottles in place of life jackets. The living conditions are quite harsh. 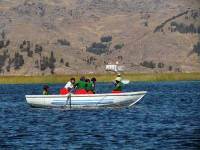 Drinking water comes directly from the cold waters of Lake Titicaca. They bathe by jumping into the lake. You risk hypothermia if you stay in too many minutes. There is no plumbing on the islands. The community builds shared outhouses a short boat trip away from living areas. At the end of our visit, they displayed home-made reed embroidery and crafts for sale. This is the main source of income for these islanders, so we bought several items. 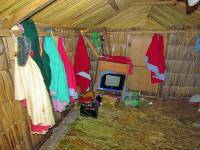 Tourism is continually changing the lives of the Uros Indians. The bright solid colors worn by the women weren’t in style a generation ago. 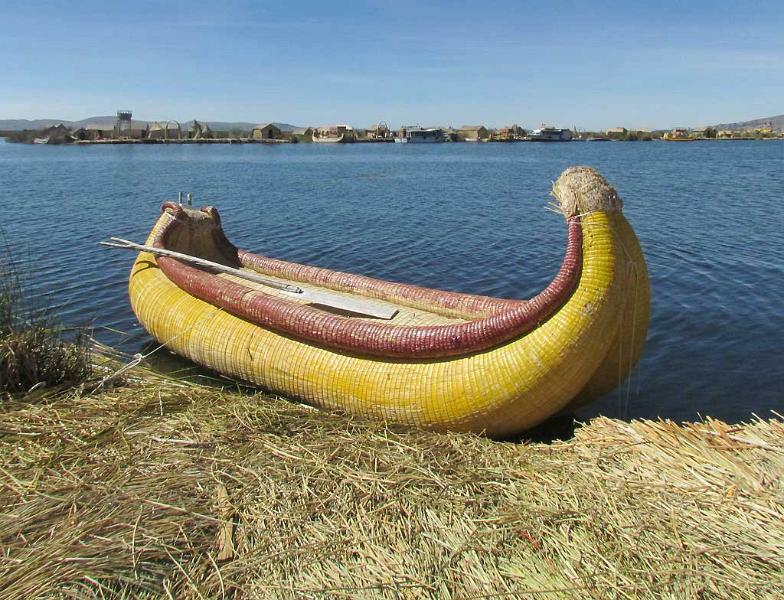 Some reed shelters have a small solar panel and television The construction of reed boats includes inserting air filled plastic bottles in the hull. This doubles the life of the boat to two years. 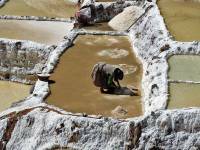 Tourism has helped the number of family units to expand to a total of 60 joined reed platforms. An elementary school operates in the islands and they have a medical center too. 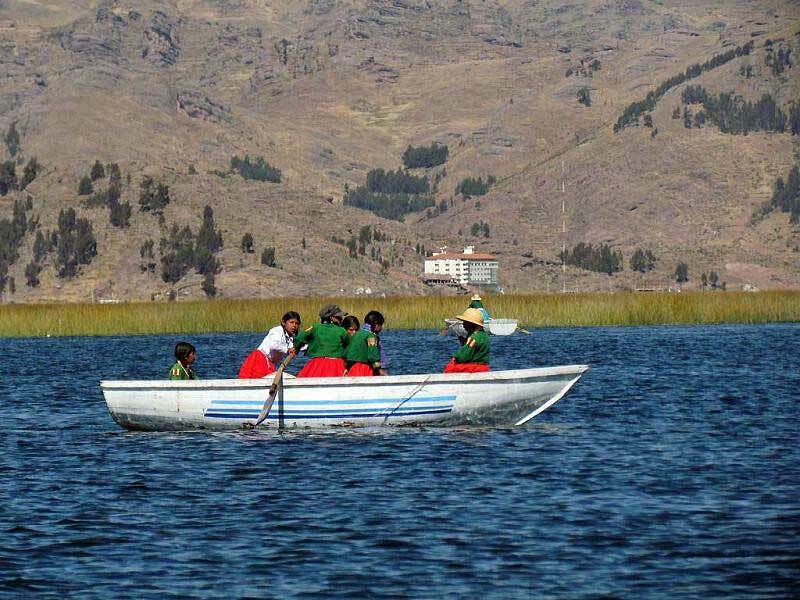 Islands have learned to speak Spanish now in addition to their native Ayamara language. Outside religious influences have resulted in the islands become 60% Catholic, 20% Adventist and 20% Mormon. Our guide said he prefers being Catholic. He likes Catholic church services more. He also likes that he can drink alcohol as a Catholic. The people of the Uros Islands are remarkable in their ability to continue living on the lake by adapting in any way necessary to ensure their survival.